As architects who build, we are continuously confronted by the friction between desire and execution. Who amongst us has not overdrawn a detail only to arrive at a jobsite to discover that it was completely overlooked by the builder? And that schedule and/or budget dictate the need to plod ahead without it? 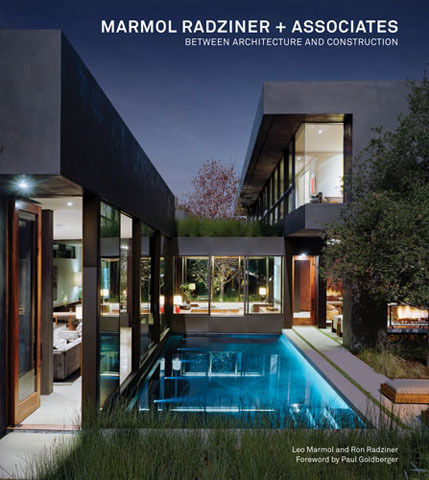 The Santa Monica design-build firm of Marmol Radziner + Associates has been tackling these contradictions for almost two decades. Their latest monograph, Between Architecture and Construction catalogues the growth and development of this practice from a young, hungry, accidental design-build firm, to a mature and confident multi-faceted practice. In their infancy, MR+A recognized a need to assert more control over the execution of their designs. The small budget projects and less skilled craftspeople that these projects afforded exposed shortcomings of the traditional architect – contractor divide. The natural next step was to assume the construction as well. Projects catalogued range from some of these early residential additions to more recent community-based buildings, retail spaces and furniture & pre-fab prototypes. Of particular note is the story of the Kaufmann House restoration, a daunting challenge deftly met, with Richard Neutra’s drawings and archives proving critical to the discovery of many original components of the house. It is a classic modern detective story. The book reads much like a diary of the practice with the standard photographs and analyses. Where the work really comes alive however is in the side-bar commentary of jobsite construction images, directives and sketches and descriptions from those with direct influence on the projects:clients, tradesman, contractors. The result is a body of work that is presented as both sophisticated architecture as well as the dirty, messy reality that made it. Perhaps this is the first true design-build monograph? This book is available at Amazon. Purchase it here and you will be supporting Tropolism.